Marco Asensio grabbed a goal and forced four others as Spain put Croatia to the sword in their Nations League clash in Elche. Croatia suffered the biggest defeat in their history as Spain thrashed them 6-0 in Tuesday’s Nations League match at Estadio Manuel Martinez Valero. 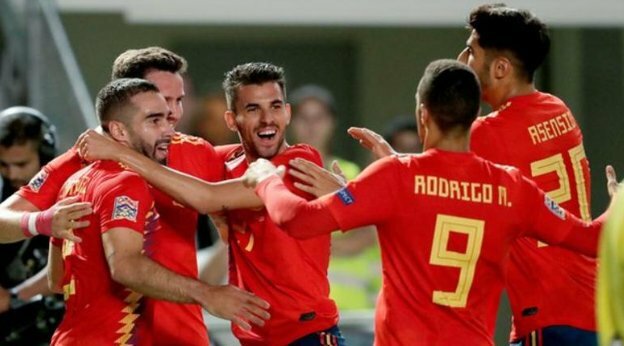 Marco Asensio scored once and set up four more in Luis Enrique’s second match in charge, as the World Cup finalists were run ragged in Elche. Saul Niguez headed Spain in front before Asensio fired in two spectacular strikes, although the second was credited as an own goal from Lovre Kalinic. Croatia, for whom Ivan Rakitic was making his 100th appearance, rarely got to grips with their opponents and conceded three times more in the second half through Rodrigo Moreno, Sergio Ramos and Isco. Ivan Santini and Ivan Perisic missed good early chances before Spain seized control 23 minutes in, as Saul headed the ball in off the turf after being picked out by Dani Carvajal’s sublime cross. It got worse for Croatia before the break as Asensio grabbed two memorable goals in the space of two minutes, first blasting beyond Kalinic from 25 yards before driving towards the box and curling a stunning effort that smacked the crossbar and went in off the unfortunate goalkeeper. Zlatko Dalic cut a furious figure on the touchline, and his mood darkened just four minutes after the restart, when Rodrigo beat the offside trap to latch onto a pass from Asensio and slot between Kalinic’s legs. The Real Madrid winger got his second assist of a spectacular display before the hour mark, his corner finding the head of the unmarked Ramos, who made no mistake from eight yards out. A memorable result was capped by a stylish sixth from Isco, who took a touch from Asensio’s pass and fired high into the net across the helpless Kalinic. More importantly, they are off to a winning start under Luis Enrique, with their performances in Elche and against England at Wembley a stark reminder of the quality they possess, which seemed to go missing in their tempestuous World Cup campaign. Croatia will hope to get their first Nations League points when they host England next month. A somewhat surprise starter given Iago Aspas’ showing against England, Asensio repaid his coach with arguably the finest performance of his career. His first goal was emphatic and he deserved his second effort to go straight in, rather than deflect off the back of the keeper. Three superbly weighted deliveries of different styles gifted his side further goals in the second half and underlined his remarkable quality.